Any tiki enthusiast needs this unique retro metal bar sign featuring a tiki image baked into powder-coated, heavy-gauged, made in the USA steel. Add some tropical flair to your home bar or man cave with the Tiki Bar Retro Metal Bar Sign. Featuring a bright, retro tiki design baked into heavy-gauge, powder-coated steel, this bar sign proudly made in the USA. It makes a perfect addition to the bar decor of any tiki enthusiast and the pre-drilled and riveted holes make it a breeze to hang up. 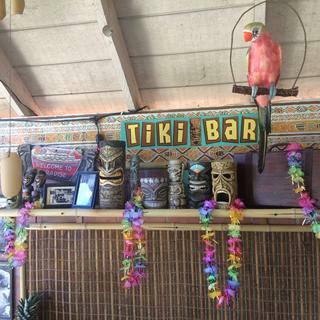 A great home tiki bar needs the right tiki decorations to really set it apart. Pick up your retro tiki sign today!